But, there are some pitfalls with planting near swimming pools. While poolside plants contribute to the tropical haven your resort provides, they can also be a real pain if leaves, fruit and other droppings are a constant problem. And lets’ face it: green waste is a natural byproduct of even the most gorgeous tropical flowers. Blooms drop. Coconuts fall. Leaves shed. All of this could land into the pool if plants are placed too close to the water’s edge. So, there’s a balance to strike when selecting pool plants for privacy. 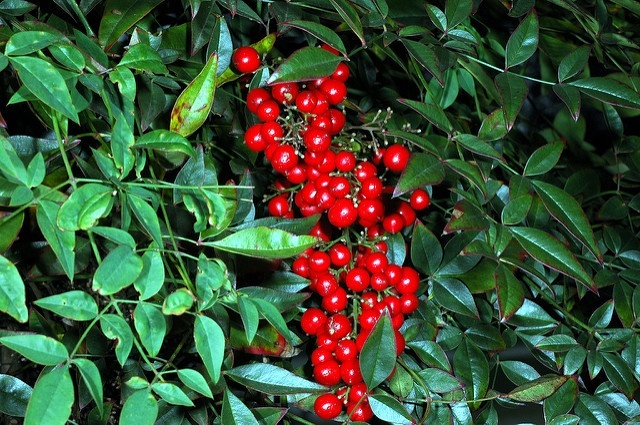 You want some greenery to screen the pool area, but the wrong plants in the wrong place can create a costly mess. (We’re talking more pool maintenance.) And this goes back to the No Ka Oi mantra: Right plant, right place. That said, here are some swimming pool plant pointers to keep in mind, plus a few plants we love for privacy near pools. As with any planting, location is everything. 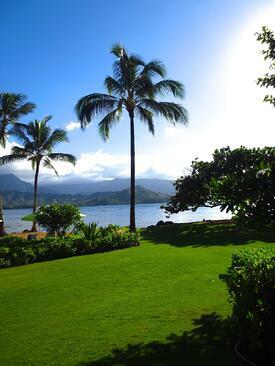 For pools that offer an ocean view, you’ll select plants that will not obstruct the breathtaking Kauai sunsets. On the other hand, pools that may be centered in gathering spaces on your resort property might call for lusher swimming pool screening plants to create a natural barrier. View from the pool: Do you want to completely screen the pool area from its surroundings, or will guests want to see beyond the pool? Height of the plant: When taller plants drop leaves, they tend to fly and land all around the pool area (including in the water). Taller plants should be placed farther away from the pool. 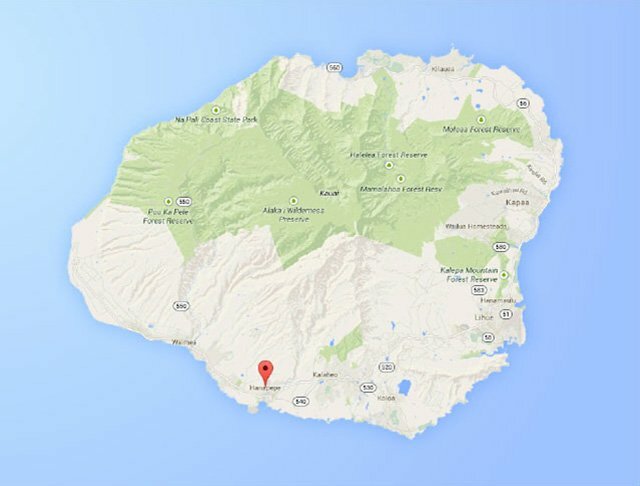 Watch for falling coconuts: We love our coconut palms here on Kauai, but they do require maintenance to prevent serious injury. So if you select coconut trees for your poolside plantings, plan on hiring an experienced professional for regular pruning. When coconut palms are located in high-traffic areas—such as by swimming pools—they must be carefully managed to ensure the safety of guests and your grounds. Because of the maintenance, you can see why we ask our resort clients lots of questions before deciding on swimming pool plants. We want to know how committed they are to maintaining their landscape, and especially pruning and dealing with dropping leaves and fruit. We want to find out if total privacy is necessary by the pool, in which case lush plantings would be the optimum choice. An alternative are tall palm trees with slim trunks that define the space but allow for views beyond the pool area. 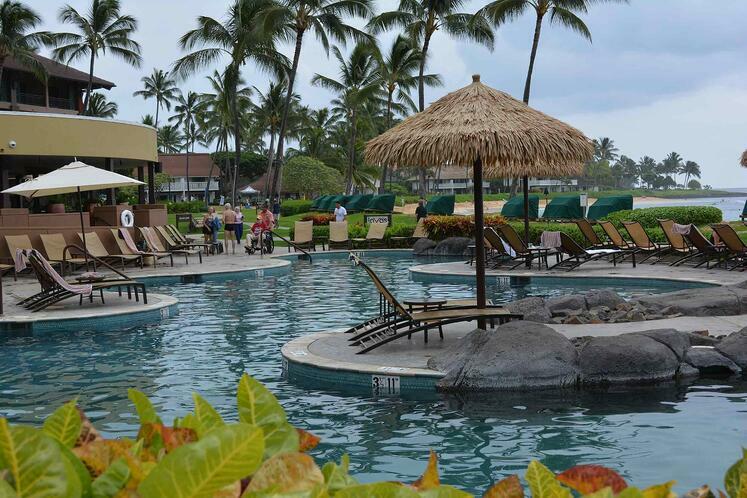 Here are some suggestions for swimming pool plants that provide privacy while creating a lush, Kauai experience at your resort. 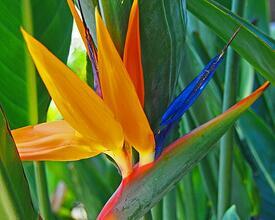 The vibrant, tropical flowers on Birds of Paradise get their name because the blooms resemble a bird soaring in the sky. The broad, large leaves of this plant are an oblong shape and create a natural privacy screen in a pool environment. In terms of leaf litter, you’re better off scooping larger leaves out of a pool than dealing with small leaves that can clog pool filters. Hawaii’s official flower is also a solid plant choice for near swimming pools—though keep in mind placement so spent blooms and leaves do not wind up in the pool filter. 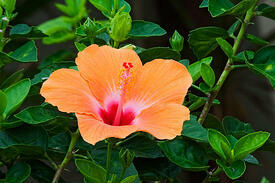 Hibiscus thrives on Kauai and are available in a range of colors, including yellow, purple, pink, orange and white. Don’t be fooled by the name of this plant. It’s not actually bamboo—but rather, a nice, lower-growing shrub that is non-invasive and provides enough thick foliage to offer screening by the pool. Its rusty red hue adds visual interest. Combine Heavenly Bamboo with other pool plants to add a pop of color. The larger, swaying foliage of queen palm trees provide some shade around the pool while allowing for views beyond the area. The Queen palm grows up to 50 feet tall, so you’ll see its shadows in the pool waters. Consider planting row of palms, or grouping of palm trees. Palm trees combined with lower-growing, lush plants like Birds of Paradise will establish privacy while adding variety to your Kauai resort landscape. But poolside plants add to the ambiance of your Kauai resort, so our recommendation is to choose wisely and select plants that enhance privacy and create a lush backdrop without adding significant pool maintenance. 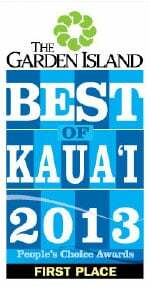 Let’s talk more about swimming pool privacy plants and or a living privacy fence for other areas of your Kauai resort. 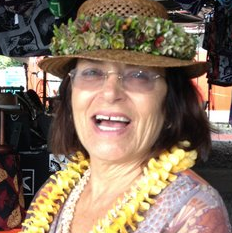 Call us any time at 808.335-5887, or fill out this simple contact form and we’ll get in touch with you.